Some people will tell you that real DIY maintenance of a gravel drive is impossible, even with a lawn tractor or ATV and a grader attachment — they’ll tell you the only real solution is a full-size tractor or grader. However, lots of Toolmongers will tell you differently. I’ve heard about or seen rigs made of I-beams, box springs, and welded monstrosities, pulled behind every kind of contraption commonly seen in a yard, field, or worksite. 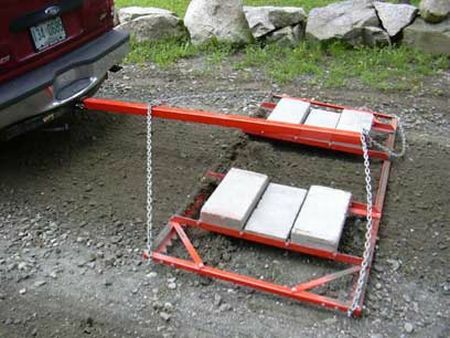 This patented Driveway Groomer, designed to be pulled by a truck with a trailer hitch, seems as good as any. Now those of us without cool tools like ATVs and bulldozers can convert our trucks, minivans, and SUVs into workhorses. The Driveway Groomer runs $350, and the Groomer Jr. goes for $265 — about the same cost as an attachment for heavier equipment. A pallet weighted down with 10 cinder blocks, behind a garden tractor, works great. Chain web would probably work. I’ve seen almost everything work that is heavy and digs in a bit. Guess I haven’t seen garden gnomes…. Seems kinda high priced for such a limited use item. I’ll stick with my Ford 8N and landscape rake!